North Atlantic Ramping up to ‘Storms of My Grandchildren’ to set off Major Flood Event for Tempest-Tossed England? Under the ongoing insults of human-caused climate change, the North Atlantic is ground zero for the potential development of the worst storms humankind has ever experienced. And indications are that the ramping up to this dangerous time may well be starting now. The temperature related weather instabilities between the warming North Atlantic, the melting but still frigid ice packs of Greenland, the retreating polar sea ice, a continental North America enduring a series of polar vortex collapse events flushing cold air south as the Arctic experiences its warmest readings in an age, and an interior Europe and Asia that are also experiencing mass migrations of cold air fleeing the ever-warmer Arctic are just screaming. A bite of warm air and related warm ocean water has flooded a large region between Scandinavia, Svalbard and Novaya Zemlya, making its home where winter sea ice once resided. The waters near Greenland are now melt-cooled by the 500 gigatons of average annual glacial outflow occurring there. And the never-ending influx and concentration of heat in the Arctic has set the Jet Stream into a fit of wild loops and whirls. All these changes result in a high degree of weather instability, in a setting off of extreme weather events, of great switches from cool, to extreme hot, from record drought to record deluge. In the past few years we’ve seen these kinds of extreme weather events occur with increasing frequency. But now, a new kind of extreme event is beginning to emerge, a kind of event that may well be prelude to ‘The Storms of My Grandchildren’ Dr James Hansen alluded to in his prescient book examining the ultimate consequences of an ongoing and devastating human greenhouse gas emission. Ever since winter began to settle in, and the extreme effects of Northern Hemisphere temperature imbalance and Jet Stream changes began to take hold, the North Atlantic has become a breeder of extraordinarily powerful storms. According to reports from NOAA’s Ocean Prediction Center, the month of December alone featured 14 instances of hurricane wind events, 10 storms that experienced rapid intensification, and 5 storms that featured pressures of 950 mb or lower. For comparison, a tropical storm that hits 950 mb is usually a category 5 hurricane. And for any ocean basin to show 14 instances of hurricane force winds let alone 5 950 mb and below storms over a one month period is extraordinary indeed. Imagine if the south Atlantic generated 10 hurricanes 5 of which were cat 5 in just one month and then you get a general comparison. Two of these storms were particularly intense with one reaching 940 mb and another deepening to an exceptionally low 929 mb (the lowest reading ever recorded for the North Atlantic was 916 mb). By comparison, the freakish monster that was Hurricane Sandy bottomed out at 940 mb. It is worth noting that the storms of the North Atlantic typically spread their energy out over larger areas than a tropical system. So though pressures are low enough to be comparible with the most intense tropical storms, the winds generated typically ranged from 75 to 100 mph while extending outward over hundreds of miles. By comparison, a typical tropical cyclone would have a very intense wind field within 20 to 100 miles of its center with intensity rapidly falling off beyond this zone. Overall, the North Atlantic sees very few storms of 940 mb or lower, usually at the average rate of less than one every year. So for two to occur in the same month is exceptional indeed. January also featured an almost endless cavalcade of intense storms rushing across the North Atlantic with numerous lows bottoming out below 950 mb (NOAA will issue a final tally sometime in February). Meanwhile, powerful storms developing in the North Atlantic continually pummeled Europe throughout most of the winter of 2012-2013 resulting in some of the worst rain and snowfall events ever recorded. 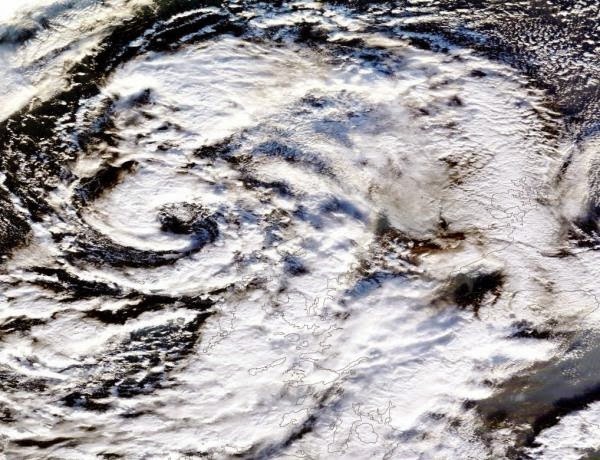 This recent climate-change driven shift of the North Atlantic into an increasingly stormy weather pattern may well be a prelude to even more extreme changes to come. Weather models produced by GISS and examined by premier climate scientist James Hansen indicate that very powerful storms arise in conjunction with increasing Greenland melt. Large pulses of fresh, cold water entering the North Atlantic were observed to create climate instabilities that resulted in very powerful storms with frontal systems the size of continents that packed the punch of hurricanes in the physical model runs. It was the likelihood that such storms could emerge by or before mid-century that, in part, spurred Dr. Hansen to write his prescient book — The Storms of My Grandchildren. As noted above, the current Greenland melt outflow averages about 500 gigatons each year. This outflow is already large enough to weaken the Gulf Stream and set off severe weather instabilities. But with Arctic warming continuing to amplify and Jet Stream patterns bringing more and more warm air over Greenland, melt rates may triple or more over the coming decades, resulting in even more severe weather consequences. So the extreme storm patterns we see emerging in the North Atlantic now are likely just a minor prelude when compared to what we will witness as the years and decades progress. Currently in the direct firing line of these powerful storms are the main islands of the United Kingdom. Throughout December, England suffered an almost constant assault of storms. In total, five storms, or more than one storm per week brought excessive rains and wind gusts in excess of hurricane force to the British Isles. The results were tens of thousands of power outages, major waves and storm surge events along the coastline resulting in damage to coastal structures and persons being swept out to sea, and increasing instances of flooding over saturated ground. In addition, December also ranked one of the rainiest with many locations seeing 3 times the normal level of rainfall for the month. As the new year began, the series of severe storms impacting the UK continued unabated through late January. And as of the 28th, South England had experienced its wettest month since record keeping began in 1910. With a month and a half still remaining Southeast England had already experienced its 6th wettest winter season on record. The extreme rainfall, as of today, had resulted in a major flood event for Southeast England focusing on the Midlands and Somerset. The event inundated croplands, homes and farms throughout the rural region and spurred England to put its military on standby as forecasts show more rain and high winds are on the way. The anomalous event also spurred the 15th meeting of COBRA, the UK’s emergency response committee which has, increasingly, been called due to a continuous barrage of weather emergencies. In addition to the clearly visible inundation, numerous villages in the region have been cut off due to flooded roads for more than a week (with some areas being cut off for a month). The constant barrage of storms has resulted in both persistently high tides and almost continuous rainfall. The rainfall, trapped by high sea water, has nowhere to escape and simply pools, continuing to build up in the low-lying lands. The UK’s conservative government’s response to the situation, thus far, has been anemic, waiting until today to declare the region a disaster area. Unfortunately, another powerful storm is predicted to arrive by Saturday bringing with it yet one more spate of strong winds, heavy surf and driving rainfall to the already soaked region. So if you’re living in Southeast England please do your best to remain safe, to heed government warnings, and to urge your government officials to provide you with the level of response you deserve during this dangerous time (including policy changes to reduce the rapidly increasing degree of harm coming from human caused climate change). It is worth noting that, though more intense than we’re used to, these storms are the early, weaker outliers of a very dangerous period that is to follow. Our best models and our best climate scientists report the likelihood of far more dangerous storms emerging from this region and from the set of conditions that includes a weakening Gulf Stream, a melting Greenland, an amped up hydrological cycle and rapidly warming zones first at the northern polar region and then in the tropics. The eventual size of these storms could expand to cover continents and involve multiple linked and powerful storm centers. As noted above, Hansen warned of frontal storms large enough to blanket continents and with areas of hurricane strength winds stretching thousands of miles. We haven’t seen anything like that yet. And so the freakish and extraordinary weather we’ve witnessed this winter, and in recent years, is merely prologue for worse events to follow. The Great Barrier Reef Marine Park Authority has approved the dumping of 3m cubic metres of dredging spoil proposed as part of the Abbot Point coalport expansion. The spoil is to be dumped about 24km from Abbot Point, near Bowen in north Queensland. The expansion of the port, which hinged on the approval of the dumping, means an extra 70m tonnes of coal each year, worth between $1.4bn and $2.8bn, will go through the port, which is also a gateway to the world heritage-listed reef. The authority granted approval with strict conditions on Friday afternoon. The authority chairman, Dr Russell Reichelt, said he recognised the amount of debate and community concern the project had generated and shared with everyone a strong desire to ensure the reef remained a great natural wonder into the future. “This approval is in line with the agency’s view that port development along the Great Barrier Reef coastline should be limited to existing ports,” Reichelt said. “As a deepwater port that has been in operation for nearly 30 years, Abbot Point is better placed than other ports along the Great Barrier Reef coastline to undertake expansion as the capital and maintenance dredging required will be significantly less than what would be required in other areas. North Queensland Bulk Ports Corporation had applied to dump within the Great Barrier Reef marine park and, although the authority was asked to make a decision within 10 days of the environment minister, Greg Hunt, approving the project in December, it asked for an extension. North Queensland Bulk Ports Corporation is also expected to come up with an alternative site that is also expected to be within the marine park. The corporation has maintained flora and fauna are unlikely to be damaged by the dumping, with the water perhaps becoming cloudy for a short period of time, but the UN body Unesco is reviewing the decision. The corporation says it would be more environmentally damaging to dump the spoil on land. World Wildlife Fund Great Barrier Reef campaigner Richard Leck said it was a sad day for the reef and anyone who cared about its future. “Federal environment minister Greg Hunt failed to show leadership on this issue,” he said. “Mr Hunt could have stopped the dumping of dredge spoil in reef waters instead he gave dumping the green light. The committee is meeting in Doha in June when it might list the reef as world heritage in danger. 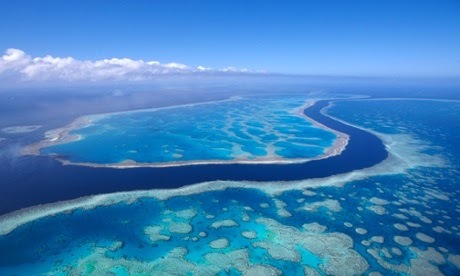 Greenpeace has previously said any dumping of spoil on the reef would be an "international embarrassment". "We wouldn't throw rubbish on world heritage sites like the Grand Canyon or the Vatican City, so why would we dump on the reef?" said a spokeswoman, Louise Matthiesson. "Scientists are clear that the potential impacts of dumping the dredge spoil so close to fringing reefs and the WWII Catalina plane wreck are significant." A swathe of England stretching from Devon in the southwest to Kent in the southeast has already experienced twice the average rainfall for the month, figures from the Met Office national weather service showed, with more on the way this weekend. The army was preparing to deploy to one part of the largely rural county of Somerset to help the residents of villages cut off by the worst flooding there for 20 years. Southeast and central southern England have had more than twice their average rainfall, with a record 175.2 millimetres (6.9 inches) falling between January 1 and January 28, beating the previous record of 158.2 millimetres for the month set in 1988. But Britain as a whole has had an unusually sodden January. The Met Office said 164.6 millimetres of rain had fallen so far in January across the entire country, which was 35 percent above the long-term average. More heavy rain is forecast from Friday, which would exacerbate the situation in areas already struggling with floods. 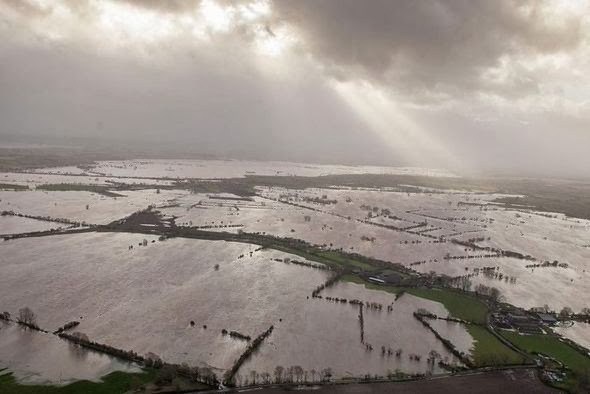 The weather has left some areas badly affected by flooding, with 65 square kilometres (25 square miles) of the Somerset Levels underwater for a month. The government has given the go-ahead for the army to help villages there cut off by the floods and specialist vehicles are being brought in so troops can deliver food, transport residents and deliver sandbags. The Ministry of Defence is deploying military planners to help the local council and a small number of soldiers arrived on the ground on Thursday. Scores of soldiers, Royal Marines and emergency services personnel will be on standby on Friday as the people of the flooded Somerset Levels brace themselves again for more rain, gales and a tidal surge. For the first time since the Levels went under water at the start of the month, military engineers and troops were on the ground on Thursday helping civilian staff plan the response to this weekend's predicted storms. Military vehicles, including Royal Marine amphibious vessels, were made available and two fire service hovercraft were on the way to south-west England. Ten high-volume fire pumps, staffed by crews from as far afield as Merseyside and Cornwall, were parked in a motorway service area in readiness for the next expected phase of the crisis. There was relief among residents that the army and marines were on the ground – but also continuing anger that it had seemingly taken so long for the government to act on the crisis. "We're grateful that something is being done," said Bryony Sadler, a hairdresser and mother who has endured weeks of flooding in the village of Moorland. "I'm thankful someone seems to be listening at last but it's been such a long time coming. It's been total mismanagement so far." Mark Corthine, a retired army major, is facing months of disruption after his farmhouse in nearby Fordgate was inundated with water and sewage. He said he was pleased the "boys" were in place. "But in reality it's come two weeks too late. I'm sorry it's taken a disaster for the Environment Agency and government to take notice of what is happening here." Corthine said he also feared for what could happen at the weekend with up to 20mm of rain predicted to sweep into Somerset, coinciding nastily with winds of up to 60mph and high tides on Friday, Saturday and Sunday. "I'm worried that water could come pouring in and more homes be flooded," he said. Nigel Smith, a resident of Muchelney, which has been cut off by floodwater, stepped off the taxi boat operated by the fire brigade between the village and the town of Langport, and said the level of response was now "terrific" – though he suggested the military presence was more political than practical. "Sending the army in is largely a political statement to satisfy people's justifiable complaints," he said. Certainly, the military's approach on Thursday was softly-softly rather than gung-ho. They were spotted in Land Rovers travelling around the Levels on what the Ministry of Defence described as "recces". 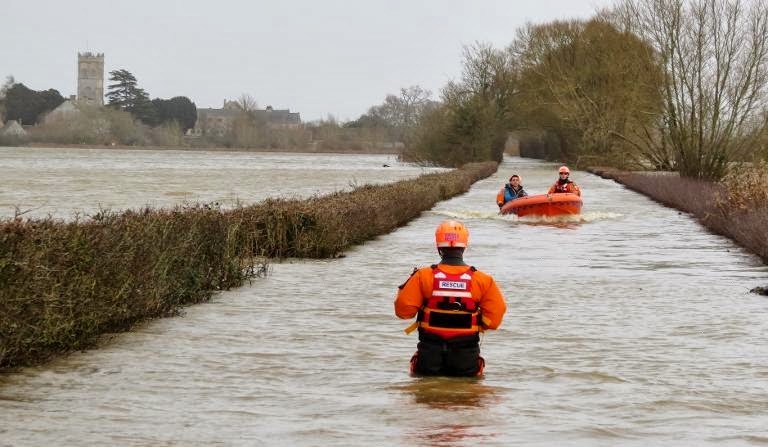 Two army engineers, currently based with 40 Commando, one of the UK's elite fighting units, surveyed the flooding at Burrowbridge on the banks of the River Parrett, where Welsh firefighters were helping their Somerset colleagues pump water out of fields and properties. The pair then climbed – rapidly – up Burrow Mump, an earthwork that has been used by the military as a look-out point and base since at least the 9th century, to get a bird's eye look at the flooded Levels. From there they drove to the edge of the floodwater surrounding Muchelney – but did not get their feet wet – before quick-marching back to their vehicle and away. Later, for the first time in the crisis, the county's strategic co-ordinating group held a press conference in Taunton. Police chief superintendent Caroline Peters said there was "real concern" about what could happen on the Levels over the weekend. She said she was happy that soldiers and marines were ready to spring into action. Pat Flaherty, the deputy chief executive of the county council, said it was "understandable" that residents felt angry and isolated. But he welcomed David Cameron's promise that the rivers would be dredged when it was safe to do so. A key complaint from residents is that over the past 20 years the Environment Agency has refused to clear the rivers of silt, making it harder to clear the Levels of floodwater. There was no sign of the Environment Agency – which argues that dredging would not have stopped the floods – at the press conference. By the time darkness fell, it had issued almost 200 flood warnings and alerts for large swaths of England and Wales including Somerset. The speakers at the press conference made it clear that residents of the Levels, were resilient. Sue Crocker, who berated the government when the environment secretary Owen Paterson visited earlier this week, said she and her neighbours were preparing for a party as the next batch of weather built. "It's going to be a high tide party," she said. "We're going to watch the water and see if it spills over. It could turn into a swimming party." Around the globe, sea levels typically rise a little in summer and fall again in winter. Now, a new study shows that, from the Florida Keys to southern Alabama, those fluctuations have been intensifying over the past 20 years. Around the globe, sea levels typically rise a little in summer and fall again in winter. Now, a new study shows that, from the Florida Keys to southern Alabama, those fluctuations have been intensifying over the past 20 years. Summer peaks have been getting higher and winter troughs dipping lower, potentially increasing flooding from hurricanes and stressing delicate ecosystems, the researchers report. The additional summer increase in sea levels over the past two decades means storm surges can rise higher than previously thought, increasing how much sea level rise contributes to the flooding risk from hurricanes, according to Thomas Wahl, a postdoctoral researcher from the University of Siegen in Germany who is working at the University of South Florida in St. Petersburg and lead author of the study. Global sea levels rose by about 5 centimeters (2 inches) from 1993 to 2011 and the newfound trend of summer sea level rise has added approximately 5 centimeters on top of that in the eastern Gulf, the research team reports. Wahl and colleagues from Florida and England published their study last week in Geophysical Research Letters, a journal of the American Geophysical Union. Conversely, an increasingly downward, winter sea level trend along the eastern Gulf Coast has reduced the flood risk from winter storm surges. At the same time, the growing gap in the region between summer and winter sea levels might be disrupting coastal ecosystems adapted to what was once a relatively stable difference between the seasonal sea levels, Wahl said. The team studied the entire U.S. Gulf Coast but found the trend toward a greater summer-winter difference only along eastern Gulf shores. Seasonal sea levels in the eastern Gulf of Mexico followed a steady cycle from the beginning of the 1900s to the 1990s, increasing in summer and dropping in winter by roughly the same amount year after year. But, starting in the 1990s, sea levels have gotten both higher in the summer and lower in the winter in the eastern Gulf, causing a significant amplification of the annual cycle, according to the study. The new work is the first to look at the changes to the sea level cycle for the entire Gulf Coast region in the United States and the first to encounter such a trend, according to Wahl. "This increase over a period of almost 20 years is not found elsewhere in the world," he said. Wahl and his colleagues discovered the trend in data from a set of 13 tide gauges stretching from Key West at the tip of Florida to Port Isabel on the Texas coast. Nearly all the tide gauges in the eastern Gulf of Mexico, from Key West to Dauphin Island off the coast of Alabama, showed a significant change in sea level cycle from the 1990s onwards. The change in the sea level cycle was not observed in gauges in the western part of the Gulf, stretching from the Louisiana coast down to the Texas border with Mexico. The 20-year increase in the annual amplitude, or difference between the high summer levels and low winter levels, was 21 percent on average and as high as 30 percent in some locations, according to the study. For example, in Key West, the annual amplitude of the sea level cycle for the most recent five-year window was 12.4 centimeters (4.9 inches), 4.5 centimeters (1.8 inches) higher than the average amplitude before 1993, when the change in the seasonal sea level cycle started. In 2013, when Wahl came to Florida on a fellowship to study the Gulf, he started by looking at the tide gauge record in St. Petersburg. The surprise of seeing a significant increase there in the seasonal cycle during the last few years led him to examine the cycle of the entire U.S. Gulf Coast in the past century. 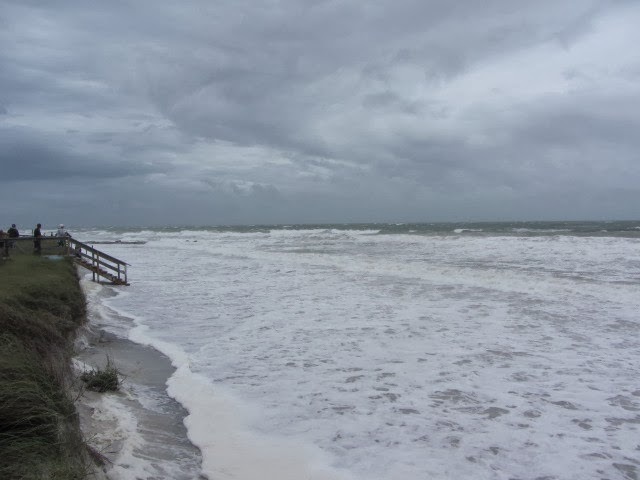 Although centimeter increases may seem small compared to storm surges measured in meters, the increase means smaller surges have the potential to inundate low-lying areas and cause erosion, Wahl explained. "These indirect effects on storm surges in addition to the global sea level rise are often ignored," he said. On the other hand, the decline in sea levels in the winter that was observed in the eastern Gulf reduces the flood risk associated with winter storm surges. However, changes in sea levels in the winter could throw off, for example, the salt balance in sensitive coastal wetlands, Wahl said. "Very sensitive ecosystems along the Gulf coast depend on the seasonal cycle," he said. "If there are significant changes in the seasonal cycle then this very likely has an effect" on these ecosystems. Significant changes in the seasonal cycle might also affect oil spills, although the researchers did not look at this effect, Wahl said. The changes in the seasonal cycle could alter the tides and associated currents, which could in turn influence the mixing of the oil and when it reached land, although the impact would likely be small, he noted. Unlike global sea level rise, which is driven by temperature and is often cited as an effect of climate change, the annual sea level cycle is driven by a variety of local factors including wind, precipitation, sea level pressure and temperature. The annual cycle varies from region to region, and, until recently, was thought to be constant from year to year. Wahl said it has only been in the past few years that scientists around the world have begun looking at possible changes in regional sea level cycles including in the Baltic Sea, Mediterranean Sea, Chesapeake Bay and the Caribbean. Coastal engineers need information about baseline sea levels in order to build sea walls to protect coastal communities, said Philip Woodworth, a scientist at the National Oceanography Centre in Southampton in the United Kingdom, who did not contribute to the study. "A change in the baseline of 5 centimeters could be an important factor," he said. Wahl said the changes he and his co-authors saw in the seasonal cycle in the eastern Gulf are driven by changes in air temperature and atmospheric sea level pressure over the past two decades. 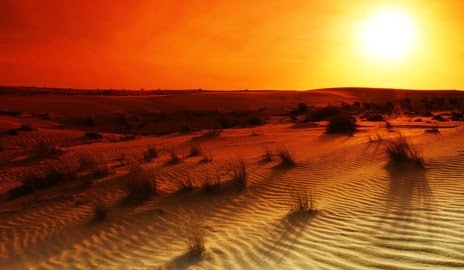 The researchers found that since 1990, summers have been getting warmer and winters have been getting colder in the region. Atmospheric sea level pressure, which also fluctuates with the seasons, declined more in the summer and increased more in the winter after 1990. Warmer temperatures and lower sea level pressure in the summer led to the higher water levels being seen in the eastern Gulf, while the lower winter sea levels were driven by the colder temperatures and higher pressure seen during that season, according to the study. The above story is based on materials provided by American Geophysical Union. Note: Materials may be edited for content and length. Insects may thrive in the warmer average temperatures predicted by climate models but are threatened by greater temperature variation also anticipated in many areas around the globe, a Yale-led study predicts in the Jan. 29 issue of the Proceedings of the Royal Society of London. Scientists have tested the impact of temperature on 38 species of insects. Vasseur and researchers from eight other organizations coupled that data with historic climate data and climate projections for 2050 to 2059 in order to assess effects of temperature variability. When only mean temperature rise was considered, insects flourished, but “greater variation impacted them negatively,” Vasseur said. The frequency of wide temperature swings will impact species like insects more than larger-bodied species with longer lifespans, he said. Also the study suggests effects of climate change on many species will vary greatly by locale. “Global climate models predict many areas of temperate regions such as the central Midwest and much of Europe will experience more climate variation,” Vasseur said. The study was funded by the Canadian Institute for Ecology and Evolution and the National Science Foundation. 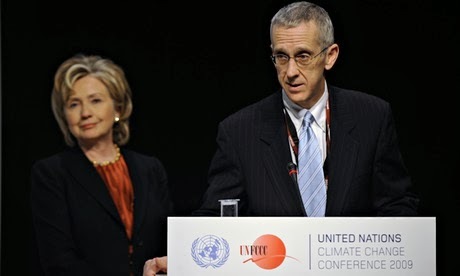 Developing countries have reacted angrily to revelations that the United States spied on other governments at the Copenhagen climate summit in 2009. Documents leaked by Edward Snowden show how the US National Security Agency (NSA) monitored communication between key countries before and during the conference to give their negotiators advance information about other positions at the high-profile meeting where world leaders including Barack Obama, Gordon Brown and Angela Merkel failed to agree to a strong deal on climate change. Jairam Ramesh, the then Indian environment minister and a key player in the talks that involved 192 countries and 110 heads of state, said: "Why the hell did they do this and at the end of this, what did they get out of Copenhagen? They got some outcome but certainly not the outcome they wanted. It was completely silly of them. First of all, they didn't get what they wanted. With all their hi-tech gizmos and all their snooping, ultimately the Basic countries [Brazil, South Africa, India and China] bailed Obama out. With all their snooping what did they get?" Martin Khor, an adviser to developing countries at the summit and director of the South Centre thinktank, said: "Would you play poker with someone who can see your cards? Spying on one another like this is absolutely not on. When someone has an upper hand is very disconcerting. There should be an assurance in negotiations like this that powerful players are not going to gain undue advantage with technological surveillance. "For negotiations as complex as these we need maximum goodwill and trust. It is absolutely critical. If there is anything that prevents a level playing field, that stops negotiations being held on equal grounds. It disrupts the talks," he said. The NSA would keep US negotiators abreast of their rivals' positions, the document says. "Leaders and negotiating teams from around the world will undoubtedly be engaging in intense last-minute policy formulating; at the same time, they will be holding sidebar discussions with their counterparts, details of which are of great interest to our policymakers … Signals intelligence will undoubtedly play a significant role in keeping our negotiators as well informed as possible throughout the negotiations," it reads. The document shows the NSA had provided advance details of the Danish plan to "rescue" the talks should they founder, and also had learned of China's efforts to coordinate its position with India before the conference. The talks – which ended in disarray after the US, working with a small group of 25 countries, tried to ram through an agreement that other developing countries mostly rejected – were marked by subterfuge, passion and chaos. Members of the Danish negotiating team told the Danish newspaper Information that both the US and Chinese delegations were "peculiarly well-informed" about closed-door discussions. "They simply sat back, just as we had feared they would if they knew about our document," one source told Information. British negotiators at the summit declined to say whether their negotiating positions had been informed by US intelligence. "It is a longstanding policy that we do not comment on intelligence matters," said a spokesman for the Department of Energy and Climate Change, the UK government department that led the negotiations in Copenhagen. Ed Miliband, who as energy secretary led the political negotiations for Britain, declined to comment. However, at the time, he was furious that the Danish text which the US had received advance information about,had been leaked to the Guardian. But one key negotiator for the G77 group of 132 developing countries, who asked not to be named, said at the time that he strongly believed that the US was eavesdropping on his meetings and would only talk in a secure back room that he thought was not bugged. "I was well aware that they seemed to know what our position was before we did," he told the Guardian. But Ramesh said that he had no idea that the US was spying on him. "I didn't get a sense that I was being followed. I didn't get a sense that my phones were tapped," he said. Civil society groups from around the world condemned the US. "The UN climate talks are supposed to be about building trust – that's been under threat for years because of the US backward position on climate action – these revelations will only crack that trust further," said Meena Raman, negotiations expert from the Malaysian-based Third World Network. "Fighting climate change is a global struggle, and these revelations clearly show that the US government is more interested in crassly protecting a few vested interests," said Brandon Wu, senior policy analyst with development organisation ActionAid in the United States. US climate activist and founder of 350.org, Bill McKibben, called the spying revelations "insane and disgusting". US diplomatic cables made public by WikiLeaks in 2010 showed that the CIA had sought intelligence from UN diplomats about the negotiations in advance of the summit, and Snowden documents published last year revealed the US had spied on Indonesia at the Bali climate summit in 2007.